Cure trigger-control errors and other woes with lasers. I always considered myself a pretty well-rounded shooter, but advanced training scenarios that included low-light shooting, shooting on the move and fighting from unconventional positions revealed a few chinks in my armor. Though I shot fairly well on the move and from odd positions such as flat on my back or across my body, I would throw the occasional shot wide and, sometimes, a bit low. Those errant shots were usually on paper, but they were not as centered as I'd like to see, given the fact that my training sessions incorporate far less stress than an actual gunfight. Fortunately, I was observant enough to quickly diagnose my problem and improve my shooting thanks to the telltale red dot emanating from my laser-grip-equipped Rock River 1911. Though I wasn't immediately enamored with weapon-mounted lasers when they first came on the scene, that range session and some subsequent, serious training sessions with various units from Crimson Trace and Viridian opened my eyes to the value of those high-tech training tools. Today, they are a key element in my training and teaching regimens. Most of my carry guns wear lasers for tactical reasons, but I get more use out of my weapon-mounted units and laser training aids on the range for diagnosing trigger and sight alignment issues. I also use them to help teach advanced shooters to shoot more accurately on the move and improve their instinctive shooting and weapon presentation. One of the main benefits of training with lasers is improved trigger control. I noticed that my errant shots when shooting on the move were a result of me trying to time my trigger pull and sight control. Now that's not a bad thing, but I was coming back too hard and fast on the trigger to make my gun go off right now. That's easy to do when shooting on the move or mowing down plates at speed. It's also very easy to see because that red dot doesn't lie. When that red dot dove hard down and left, it was obvious to me what was going on. That fast diagnosis made it easy to fix the problem before it became a habit. Now I spend 10 to 15 minutes two or three times per week dry-firing at the many mounts around my office and living room with one of Laserlyte's Laser Trainers. The sound-activated trainer emits a brilliant red dot every time you pull the trigger. It's made a huge improvement in my shooting from every position. For live-fire practice, especially when training new shooters, I am fond of Crimson Trace's laser grips. Flinches and heavy trigger fingers are easily diagnosed and readily apparent to me and the student. That's important, because many new shooters will insist that their sight picture and trigger squeeze were perfect until you hand them a laser-sighted gun with a dummy round mixed in the magazine. The embarrassment of that giant jerk will get them on track in a hurry. Young shooters are particularly good at learning from visual cues like a laser. At six years old, my son had poor trigger control. He would stroke the trigger smooth as silk one time, and yank it hard it enough to straighten it the next. He was shooting only air guns and silenced .22s at the time, so it wasn't recoil or muzzle blast, and no amount of coaxing would help. A little practice with a Viridian laser on his Walther P22 fixed his trigger finger right up. 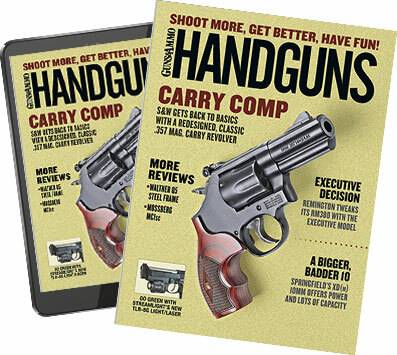 The author finds that shooting-on-the-move drills with a laser and unloaded pistol really hone this difficult skill—and are a lot of fun besides. My son's sight alignment also benefited greatly from the use of a laser. I explained the sights to him and drew countless pictures, but zeroing the laser to hit right on top of the front sight helped fix the proper sight picture in his mind. He's nine now, and he's been downright deadly with his iron-sighted BB gun and .22 for a couple of years because he started out with a little quality practice time with a laser. Adults can benefit from laser training, too. New shooters are especially prone to sight alignment issues. Though they say they grasp the concept, their targets sometimes tell a different story. I've had good luck curing this with a little help straight from the Crimson Trace manual. Have your student draw a laser-grip-equipped pistol, raise it to eye level and begin to acquire a sight picture on a mutually agreed-upon portion of the target. As the student raises the gun, block the laser with your finger. When the student says he or she is on target, remove your finger and see where the beam is on the target. You have to show most shooters this only once or twice for them to figure out their sight alignment error and correct it. Lasers are also a fantastic training tool for advanced shooters and concealed-carry permit holders. Regardless of your skill level, they aid in mastering weapon presentation, shooting on the move, and instinctive shooting, which are all interrelated. A perfect presentation ends with the pistol right on target. A little time spent drawing a Crimson Trace laser-equipped pistol at a target will help you master a smooth presentation that ends with your muzzle on target. It will also help you determine if your pistol fits your hand. If you can perfect that presentation and your gun fits, your first shot will be a decisive fight stopper, regardless of whether you use the sights, a laser or shoot instinctively. Many shooters don't really consider weapon fit, but it is essential. If your pistol doesn't fit your hand, your presentation will never end up on target naturally, and your shooting will suffer. If you find that your laser is consistently off in one direction or another when you bring your chosen carry gun to bear, you need to trade in that pistol on something that conforms to your hand. You can argue the validity of instinctive shooting all you want, but I don't believe any amount of training will make you look for your sights when someone is shooting at you from six feet away. In such dire circumstances, a solid presentation and the ability to hit where you look is a must. Honing those skills to razor sharpness with a laser is a sure way to tip the odds in your favor. ooting instinctively most of the time. Such unaimed fire works for me because I've spent so much time perfecting my weapon presentation and instinctive shooting skills. I can get down on the sights when I need to, but I am confident in my ability to defend myself and my family at close range with instinctive shooting thanks to a great deal of laser-aided practice. Firing from unconventional positions is difficult for most shooters, and a laser can quickly show you what you may be doing wrong. A great deal of my practice is done dry with one of Laserlyte's excellent laser trainers. I start my routine by making sure my pistol is unloaded, and then I focus on a small target such as a doorknob or light switch. Then I bring the pistol to bear on the target from the Low Ready position and dry-fire, maintaining a visual lock on the target throughout the process. More often than not, my shot is right on the money or, at most, within an inch or two of my intended target. I do that 25 to 30 times per session. Next, I focus on the same target and fire the gun from a solid weapon-retention position. I don't do quite as well like this as I do from the Low Ready position, but I am accurate enough to get the job done. I do this one 25 to 30 times, too. I like to work some unconventional positions into my training, so I usually do 25 to 30 repetitions from my back to simulate a struggle. This is harder than it sounds if you work several angles. I usually mix up my shots between shooting across my body, behind the top of my head and between my feet. I also do several repetitions from a seated position, firing to the right and left to simulate defending a carjacking. There aren't many live-fire ranges where you can do this type of training; the laser makes it possible and safe. The final step in my training is shooting on the move. Once again, the many animal mounts throughout my house are my preferred targets. I like to pick a few targets and move about the house, at speed, shooting at specific parts of each animal. I don't always hit my spot, but the target focus that comes from staring a hole through the eye of an impala, for example, makes most of my shots land pretty darn close. I vary my movements to include side-to-side, diagonal, retreating, advancing and any other crazy angle or haphazard pattern I can think of. I don't count reps because it's so much fun; I often spend up to a half-hour or more moving around the house shooting stuffed animals with my Laserlyte-equipped S&W M&P Pro. It might sound a bit twisted, but I know it works because I shoot box drills with much greater speed and accuracy than I even thought possible before I incorporated lasers into my training. Clearly, training with a laser has many advantages over live-fire-only practice. Safer, more realistic training is one benefit, but the frequency that comes from being able to practice in your home, rain or shine, must not be overlooked. Another benefit is cost. Sure, you'll have to spend a few bucks to get a quality unit, but at today's ammunition prices, that money will be quickly outweighed by the ammo savings. Whether you're a new shooter trying to learn the fundamentals, a competitive shooter looking for an edge, or a CCW holder looking for a better, safer way to prepare for the dark day you hope never comes, there's no doubt that training with a laser will help you become a better shooter. Units such as Crimson Trace's Lasergrips are great for work on presentation and live-fire trigger control. The Laserlyte unit, which fits into the muzzle of an unloaded gun and fires a beam with each trigger pull, is perfect for dry-firing.